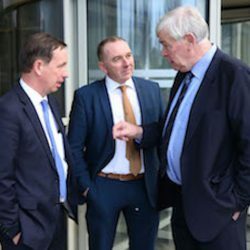 Acting General Secretary Bryan Barry, National Chairman Jer Bergin and Deputy President Tim O'Leary at today's meeting of the IFA Executive Council in Dublin to decide on the election date for the next President. 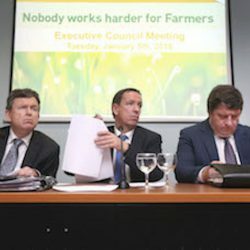 The IFA Executive Council has agreed in principle to the proposal put forward by the Executive Board for their positions to be put up for election this spring. This is subject to a rule change which will be put to the Executive Council in 28 days times. 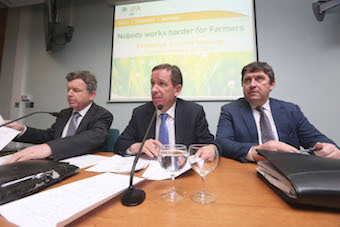 The Executive Board of the IFA had come under pressure since November to resign after Pat Smith and Eddie Downey resigned. Smith resigned first before his remuneration was revealed and Downey resigned after he signed an exit package with smith. 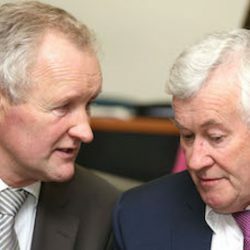 Despite calls for the Executive Board to resign it survived a vote of no confidence on the day the Con Lucey report was published. 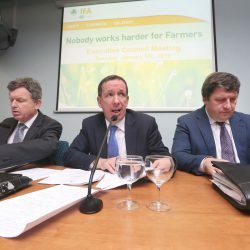 However, when Chairmen returned to their counties, many were told that they should not have voted until IFA members had a chance to read and digest the Lucey report. At today’s meeting which stretched into tonight, it was also agreed by the Executive Council to allow the rules changes necessary to facilitate pushing out the date for the Presidential election.